I was asked to make 10 of these thank you cards for Ruth and Henry for their daughter Daisy's Christening this weekend. I made almost exactly the same card last month but this time I used the organza ribbon. I took all (well almost all) of the things I needed to make these but I left the thank you stamp in the UK so I finished these off today using my stamp-a-ma-jig. Supplies: Stamps: HOTP (QVC UK kit). Ink: Brilliance (Pearlescent Coral). Paper: Bazzill cardstock, Basic Grey (Blush), MME (Bohemia). Accessories: Bazzill Wings (Bitty Blossoms Flowers (Pink & Brown). I have so wanted to make one of these Criss Cross Cards and wasn't sure I would be able to before we leave for our holiday. I MADE TIME!!! I am so pleased with the result. I love the apple green it is so calming to me. 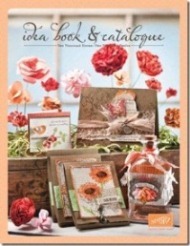 Supplies: Stamps: HOTP (QVC UK kit), Anita's scribble flower. Ink: Vaersafine (Vintage Sepia), Brilliance Dew Drop (Coffee Bean). 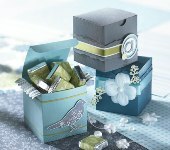 Paper: Bazzill cardstock, Wild Asparagus (Adorable Stripe/Light Blue). Accessories: Light Yellow Organza Ribbon.